Has “huh, what?” become your middle name? Or perhaps unfinished projects are piling up around you? Don’t worry. Everyone gets distracted from time to time. And there’s so much competing for your attention these days. It’s really no wonder you lose your focus from time to time. But if staring off into space is your new normal… or getting SIDETRACKED is more common than being ON TRACK… you might be battling age-related cognitive decline. And it is time to do something about it. A recent study published in the Journal of Alternative and Complementary Medicine has revealed a surprising solution. It turns out spearmint could help give you the laser focus and steel-trap memory of your dreams. Researchers recruited a group of 90 volunteers between the ages of 50 and 70. All the participants had typical age-related cognitive decline. The first group, the control, got no spearmint. Group two took 600 mg of spearmint daily. And the third group received 900 mg of spearmint per day. And the team monitored their cognition, sleep, and mood for three months. The lucky folks in group three saw improvements all the way around. Memory, attention, and focus scores soared by 15 percent over the placebo group. But the spearmint benefits didn’t end there. They ALSO had measurable improvements in their “vigor and activity” level. Meaning they felt more energized and were able to get more done. Plus, group three’s overall mood and ability to slip off to sleep both climbed too. Experts credit the phenolic and antioxidant compounds in the spearmint extract for helping to keep the brain firing on all cylinders and fighting off cognitive decline. Phenols help protect plants against threats and stress. And in people they can provide all kinds of medicinal benefits including, it appears, helping to support your brain. Meanwhile, the antioxidants provide additional support by reducing inflammation. 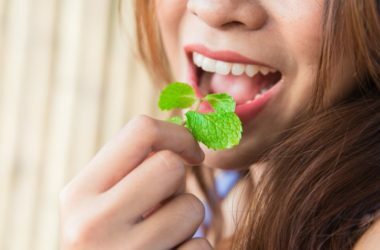 And this isn’t the only promising study on spearmint and brain health, either. Spearmint is a low cost and effective way to help you regain focus and boost your memory. If your concentration could lose a little help or your brain burps bother you go ahead and give it a try. Spearmint supplements and teas are available online and wherever supplements are sold. And fresh spearmint leaves make a delicious addition to all kinds of beverages, fruit salads, and garden salads.